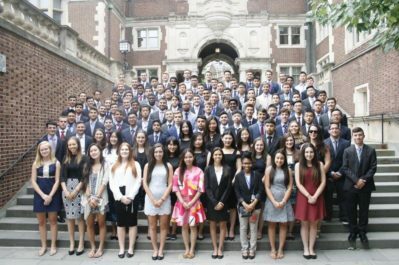 Sponsored by the Wharton School of the University of Pennsylvania and the Wharton Sports Business Initiative (WSBI), the Wharton Sports Business Academy (WSBA) is a summer institute that provides an opportunity for talented rising high school juniors and seniors to study sports business leadership at the Wharton School. 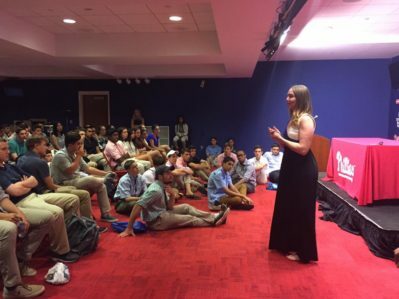 This program teaches students about ownership, sports agents, marketing, media, and labor as they meet and learn from leaders in the sports business world. The program examines various academic disciplines as they apply to the sports industry with an overview of the business and legal aspects of various intercollegiate, Olympic and professional sports enterprises. Students visit some of the region’s most important facilities, and ultimately gain insight into the leadership, management, and increasingly global nature of the sports business. Through academic and co-curricular activities, WSBA students have the opportunity to test their potential as future sports business leaders. Click here for information about WSBI’s sports analytics summer program, Wharton Moneyball Academy. Check out what past students have to say! Mornings are spent attending classes at the Wharton School. Students learn from Professor Scott Rosner and other leading sports business academics who are known for their ability to condense difficult concepts into easily understandable ones with enthusiasm, making the materials come to life. Afternoons are spent learning from and meeting with some of the most respected leaders in the sports industry in both the classroom and at sports facilities. Past trips have included visits to Under Armour Headquarters, M&T Bank Stadium in Baltimore, Nationals Park in Washington, DC, The Atlantic Health Jets Training Center in New Jersey, Citi Field and USTA BJK National Tennis Center in New York, as well as Citizens Bank Park, Talen Energy Stadium, Wells Fargo Center, Lincoln Financial Field, Comcast headquarters and other historic sports venues in Philadelphia. Living and working with students from the USA and around the world, you will gain a unique perspective on college life. Participants live in Penn’s famous Quad in the University City District; walking distance from dozens of restaurants, shops, recreational facilities and entertainment venues. After class, you can enjoy your choice of on and off-campus activities organized by our staff. Residential life is managed by Julian Krinsky Camps & Programs, a leading creator of world-class summer education experiences. Applications for the Wharton Sports Business Academy 2019 are now closed.